I don’t do Januarys. Christmas lights have come down and with that a sense of greyness has descended. The coldest, dreariest and seemingly longest month of the year is not the time for the self-inflicted misery of restricted diets and sobriety. The summer months are prefect for salads and smoothies. January calls for hearty, comforting foods that wrap themselves around you like a warm blanket. Thankfully, healthy and hearty are not mutually exclusive. This little soup ticks all the January boxes. It is quick to prepare with zero chopping and peeling. It is virtually fat-free and is high in fibre – both attributes that tend to be high on the January agenda. But most importantly, for me at least, it is decadent and deeply satisfying. It is creamy and buttery, belying its fat-free righteousness. The lentils impart a nutty flavour and a toothsome texture – it feels like so much more than just a soup. You come home from work tired and cold and perhaps a little cranky because some Biddy* at the bus stop nearly took your eye out with her umbrella. This rich and nourishing soup can be on the table in 20 minutes, with most of that time being spent toasting your toes by the fire. It is only slightly more troublesome than heating a can of soup but simply cannot be compared in terms of nourishment, flavour and satisfaction. Unless I am baking I rarely weigh ingredients, but instead use mugs and bowls to measure dry goods. For this recipe I have provided both specific and “mug” measurements. As long as your mug is average size (about 12 oz) it should still work out perfectly as the water to lentil ratio remains the same. I use fish sauce to season my soups. You really can’t taste the fish – it simply imparts a deep, umami flavour. However, if you’re not fond of fish sauce, don’t have any to hand or want a vegetarian / vegan soup then you can substitute sea salt or part of a stock cube. Do not add either salt or stock cube to the water when boiling the lentils as it tends to toughen them and they will never quite soften. Bring the water to the boil in a medium saucepan. Add the lentils, bring the water back to the boil and simmer, uncovered, for 10-15 minutes until the lentils are soft to bite. Add the tomatoes, bring back to the boil and simmer for another 5 minutes. Using a stick blender, blend the soup until it is completely smooth – about 1 minute. If you don’t have a stick blender you can use a counter-top blender. Be sure to add the soup in small batches and hold the lid in place with a cloth as hot liquid can easily escape and scald if the blender is too full. Add the fish sauce or your choice of seasoning a little at a time. Tins of tomatoes can vary in their salt content and tastes differ – by adding a little at a time you can get it exactly to your liking. Pour into a bowl or mug, sprinkle with freshly ground black pepper and savour! 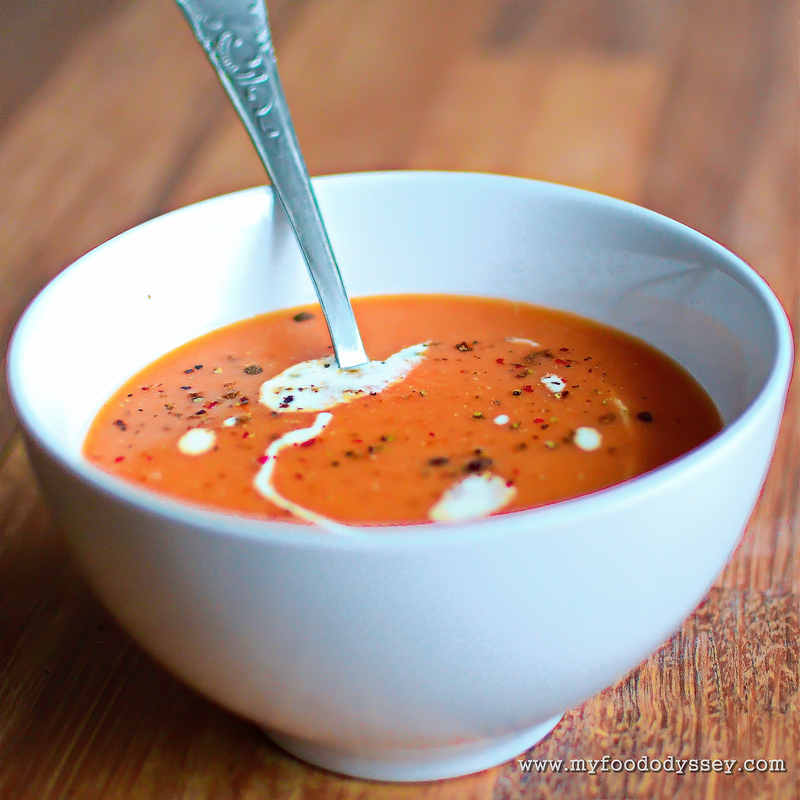 This soup already has a creamy texture but I still like to add a drizzle of single cream, mostly for decoration. 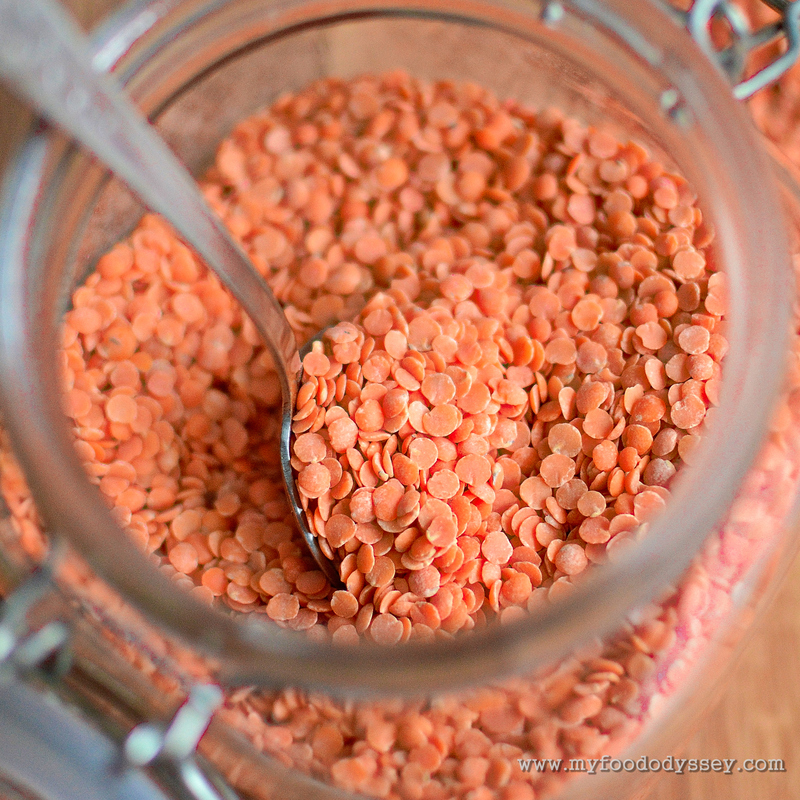 Lentils are quite high in protein, but for added protein and higher calorific content add a spoon of homemade peanut butter before blending, as I’ve done in my recipe for Pumpkin & Peanut Butter Soup. My husband is particularly fond of this version after a gym session. 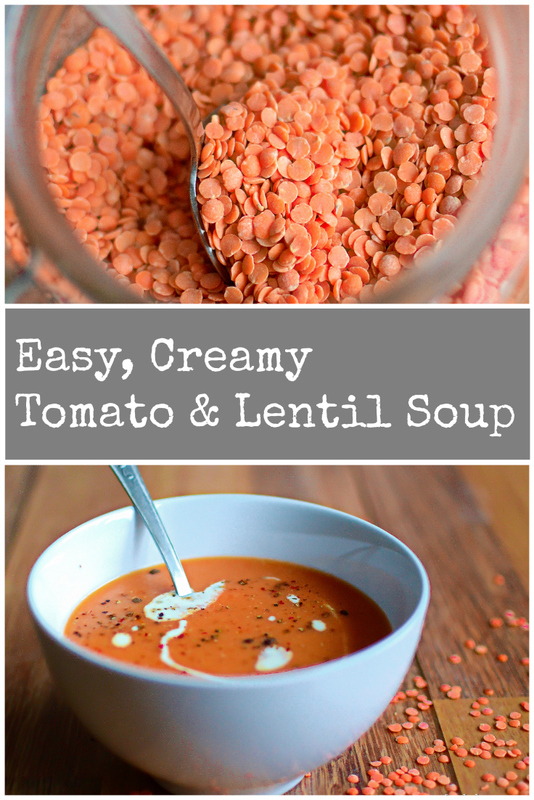 Chillies work really well with both lentils and tomatoes. Sprinkle chilli flakes to taste directly into the bowl so that each person can choose how much heat they’d prefer. There are few things that will warm your winter cockles quite like this soup. Whiskey does, of course, work well against winter chills. Whiskey doesn’t really work in this soup, but if you put a nip in your hot chocolate later, I won’t tell anyone! PS: Our half pig is arriving tomorrow to be butchered from scratch. This could be interesting! Must try. Sounds SO yummy! Sounds delicious. Perhaps the stock cube has made my lentil soups gritty rather than buttery in the past. Yeh, salt and lentils are definitely not friends. There’s no problem adding stock after cooking, but they get a bit leathery if added during cooking. Do try it, Linda – it’s super easy and great in this cold weather. Enjoy! I’ll look forward to that, Linda – I know it will give me a good laugh! The mind boggles! You might be using a different definition of the word “butcher”! PLEASE take photos if you try that!